This past weekend, fans of the FINAL FANTASY® Trading Card Game witnessed the crowning of the game’s first ever North American Champion. 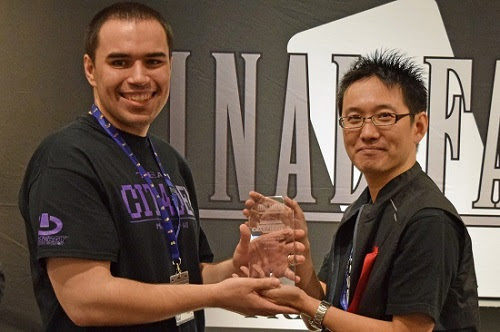 SQUARE ENIX® congratulates Joseph Leszczyski from Milwaukee, WI, the winner of the inaugural FINAL FANTASY Trading Card Game (“FFTCG”) Opus Series North American Championship tournament 2017. Leszczyski and the rest of the Top 4 finalists are invited to participate in the World Championship Finals in Japan this November. Pictured below: Leszczyski and FINAL FANTASY Trading Card Game Producer, Taro Kageyama.